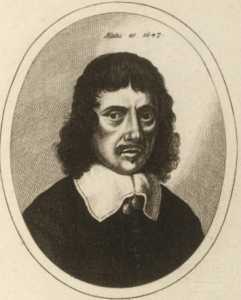 enceslaus Hollar (1607-1677) published his 30 copperplates the first time in 1651. There's some uncertainty about the number of editions. The literature has several references to a 1647-edition. One example is Massmann(1), who refers to Douce as a source. But if one looks at the relevant page in Douce(2) there's no mention of neither a 1647 nor a 1651 edition. Similarly, Warthin(3) doesn't mention any 1647-edition either. It gets even more confusing when Massmann describes this 1647-edition: »Dann S.2. Hollar's Bild (von Barlow) AEtatis 40. 1647«. 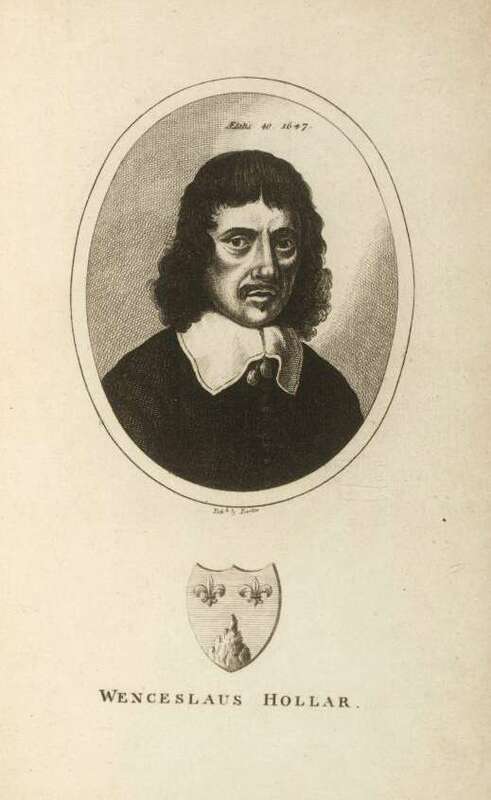 It is true that later editions contain Barlow's copy of Hollar, self-portrait (image to the left), but it sounds highly improbable that a book published by Hollar the same year would contain a copy executed by the 21 years old Barlow, instead of the original engraving by the master himself. It gets even worse as Massmann tells us the books ends with a picture of Hollar at the age of 76: »Schluss Hollar's bild "Wencislaus Hollar Obt Lond. 1677. aetat. 76"«. 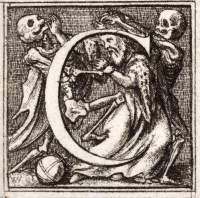 Hollar did in fact die (Latin: "obit") in 1677 (being 70 years, not 76). 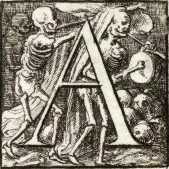 But how could such an image have been included in an edition from 1647? 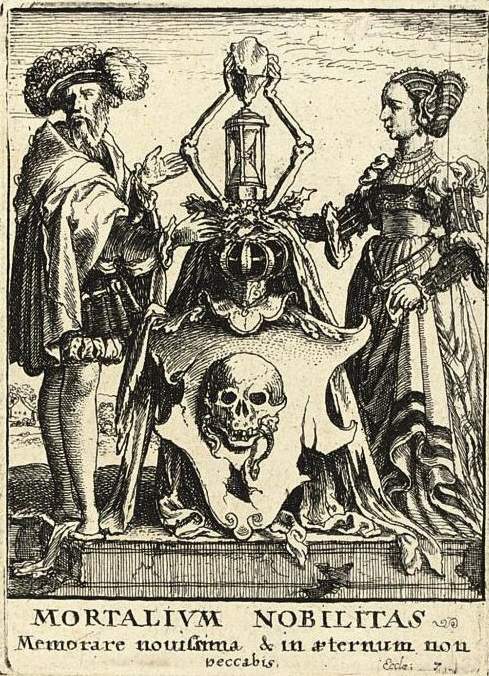 The first certified edition then is from 1651, where the title of the book was the same as the title Hollar put below his version of Death's Escutcheon, namely "Mortalium Nobilitas" (picture below to the left). The 30 plates were adorned by 3 frames designed by Abraham Diepenbeeck (who was a pupil of Rubens). These 3 frames depict Democritus and Heraclitus, Minerva and Hercules and Time and Eternity (click the links and then the image to see the frames). The 1651-edition of Mortalium Nobilitas. As shown by the picture to the right, the 30 plates and their frames were originally without signatures. 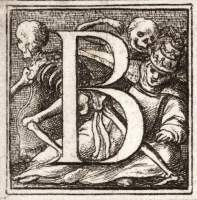 Around 1680 the plates were signed with Hollar's initials — a conjoined WH — and HB.i. 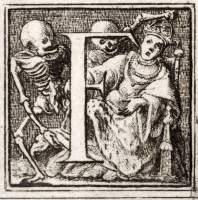 for "Holbein invenit" at the bottom of the engravings. Douce writes that at the bottom of the frame with Time and Eternity is written »Ab a Diepenbecke inu. W: Hollar fecit«, and the same on the frame with Minerva and Hercules, where the year 1651 has also been added. The third frame, according to Douce, isn't signed. Douce calls this edition »the first and most desirable state of the work, the borders having afterwards fallen into the hands of Petau and Van Morle, two foreign printsellers, whose impressions are very inferior«. From this we can deduce first of all that Douce doesn't know the 1651-edition (let alone any 1647-edition), and secondly that Douce's edition is older than the edition from the Wenceslaus Hollar Digital Collection. Here, the very Petau mentioned by Douce, has written himself unto the third frame: »Ab. a Dvpenbecke inu. A Paris, Chez N. Pitau, rue St. Jacques proche les Mathurins, W. Hollar fecit«. 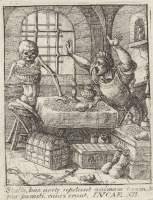 In the edition located at the Wenceslaus Hollar Digital Collection the frame around Death's Escutcheon has been further "improved" with the text »Auec priuelege Du roy«, but strangely enough only this one image. The other images with the same frame don't have this addition. In contrast the exemplar located at the Folger Shakespeare Library, has »Auec priuelege Du roy«, every time the frame with Democritus and Heraclitus is used. After 1680, the changing taste of fashion made the plates obsolete and they disappeared from the public. A hundred years later there was a renewed interest in things medieval, and the world was ready for another round of Hollar. 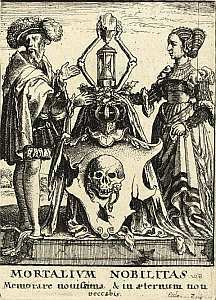 Hollar: Death attacks with an arrow instead of a bone; Death has no shield, but grabs the soldier; the hourglass has been placed on one of the fallen men. These are all variations that Hollar has copied from Birckmann. 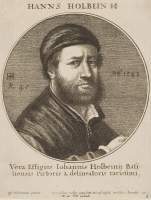 he funny part is that most of Hollar's plates are not copies of Holbein, but rather copies of Arnold Birckmann. 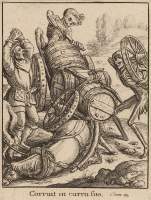 Birckmann's woodcuts often depart radically from Holbein's original cuts. 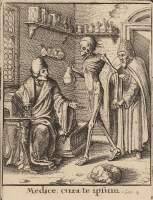 He likes to add buildings in the background, and he tries the include Death's hourglass in those pictures, where Holbein has "forgotten" it. In 20 out of 30 cases, Hollar has preferred Birckmann's variations to Holbein's original cuts (see the individual pages for details): the Expulsion from Paradise, Life after the Fall, pope, queen, abbot, abbess, advocate, preacher, nun, physician, miser, merchant, count, countess, noblewoman, peddler (sword) child, the escutcheon of Death, soldier and gambler. 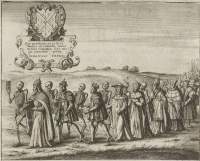 In these 9 pictures, Hollar ignores Birckmann's changes: Temptation and Fall (Birckmann's copy is very divergent), the emperor (extra people, the direction of the emperor's glance), the cardinal (espalier, disappearing money-box), the empress (tower in horizon), the duke (round tower with hourglass), the monk (keeps pillar), the old woman (tree instead of stalks), the old man (hourglass and background) and the peddler (the dog's tail). So Hollar was perfectly aware of Holbein's originals and had access to them. A much more obvious explanation then — and one that will probably pain many art connoisseurs — is that Hollar in many cases has consciously preferred Birckmann's changes. 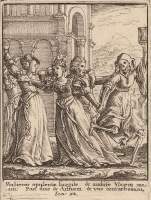 This wouldn't be a unique case: Eberhard Kieser normally follows Holbein's originals very closely, but he has also had access to the 8 plates in Aldegrevers dance of death, and in 7 out of 8 times, he has preferred Aldegrever's copy to Holbein — just like Hollar in 20 out of 30 cases prefers Birckmann's copies to Holbein's originals. 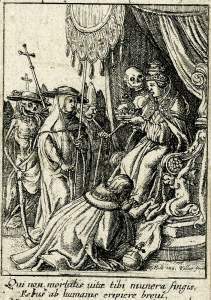 This version of the pope follows Holbein's original woodcut. 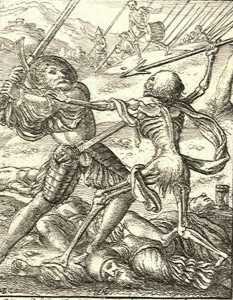 o Hollar's dance of death was copied after Birckmann's editions instead of Holbein's original woodcuts. It is most likely that Hollar, having discovered the error which he had committed in copying the spurious engravings before-mentioned, and subsequently procured a set of genuine impressions, resolved to make another set of etchings from the original work, four only of which he appears to have executed, his death probably taking place before they could be completed. These are, 1. 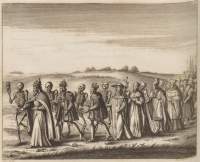 The Pope crowning the Emperor, with "Moriatur sacerdos magnus." 2. The rich man disregarding the beggar, with "Qui obturat aurem suam ad clamorem pauperis, amp;c." and the four Latin lines, "Consulitis, dites, &c." at bottom, as in the original. 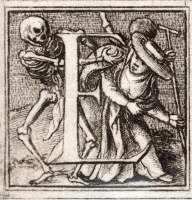 It is beautifully and most faithfully copied, with [Holbein inv. Hollar fecit]. 3. The Ploughman, with "In sudore vultus, &c." 4. The Robber, with "Domine vim patior." Douce, who were no fan of Birckmann's variants, speculated whether Hollar had made a mistake in copying Birckmann and whether Hollar had later started rectifying this error. The fact is, as Douce points out, that Hollar made another version of the pope (to the left), which is a copy of Holbein's pope in contrast to Hollar's first pope, which was a copy after Birckmann. 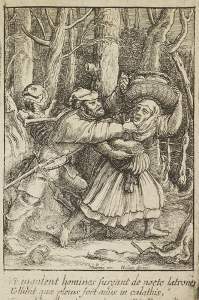 In the same way Douce is also right that Hollar has produced three scenes that were not included in Mortalium Nobilitas, namely the robber (picture to the right), the senator and the peasant. To my knowledge, nobody knows when these four plates were produced but it seems fair to assume along with Douce that they are later works. Hollar copied the capitals A-F (see further down on the page). 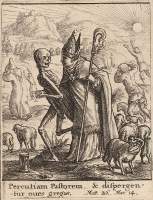 In Dugdale's History of St. Paul's, and also in the Monasticon, there is a single etching by Hollar of Death leading all ranks of people. It is only an improved copy of an old wood-cut in Lydgate's works, already mentioned in p. 52, and which is altogether imaginary, not being taken from any real series of the Dance. This means that Hollar copied the rough woodcut from a book about Saint Paul's Cathedral in London from 1554 and made a technically perfect version of this scene (picture to the right). Furthermore Hollar copied the capitals A-F from Holbein's dance of death alphabet (picture to the left and further down). A final thing that bears mention is that Hollar copied Holbein's self-portrait (top, right corner of this page). Hollar was in turn copied by Thomas Neale, David Deuchar and an unknown English artist. Read more about the later editions of Hollar from around 1800. 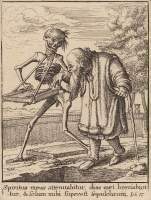 Wenceslaus Hollar Digital Collection - many works by Hollar — including the dance of death in various editions. Contains an exemplar from 1680. The Virtual Copperplate-cabinet - lots of artists scanned in high quality (look for »Hollar« and »totentanz«). 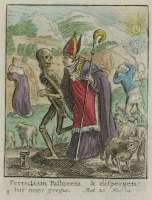 This version of the dance of death is without the frames. 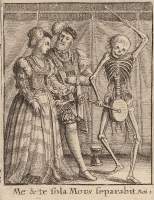 Fine arts museum of San Francisco - has more than 600 works by Hollar, but only a single print from the dance of death. Hollar is often for sale on Ebay. Hollar was republished around 1800. Hollar was copied by David Deuchar. Hollar was also copied by Thomas Neale. Hans Ferdinand Massmann , Litteratur der Totentänze, 1840, page 25. 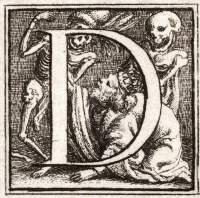 Francis Douce, The dance of death exhibited in elegant engravings on wood with a dissertation on the several representations of that subject but more particularly on those ascribed to Macaber and Hans Holbein, 1833, page 125. See the separate page about Douce. Aldred Scott Warthin, The Physician of the Dance of Death, 1931, pages 72-73.